← Can’t Hardly Wait – Drink or Cellar White Wines? I’m just back in Rome after spending 2 weeks in the Chianti region’s rolling hills! Unfortunately I was doing very little wine tasting because I was working with Italian children at a Summer Camp but I did manage drink in the scenery (and a couple of bottles here and there) for 14 warm summer days! I was located in the small area of Castelfiorentino, which is in the Chianti region between Florence and Siena. 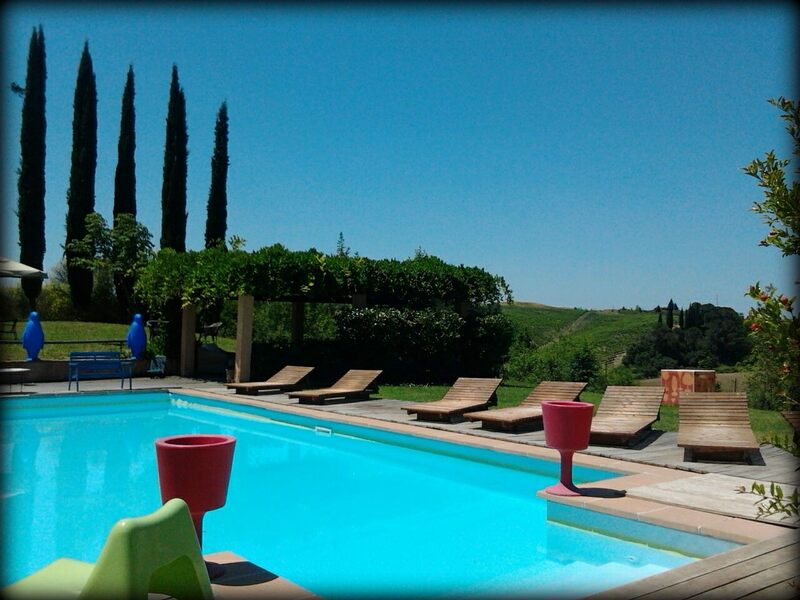 I stayed at an agriturismo (=farmhouse and hotel) called Il Grande Prato. Nearby was a winery called Castello di Oliveto which makes a handful of different and tasty wines ranging from Chianti Riservas, to Cabernet Sauvignon and Merlot blends to Grappa and Sparkling Spumante! Strada del Vino Vernaccia di San Gimignano which includes the celebrated white wine Vernaccia di San Gimignano and the red Chianti DOCG Colli Senesi. Strada del Vino di Montespertoli where they produce Chianti DOCG di Montespertoli, Chianti Colli, and the DOC reds, rose’s, and white wines of the Colli dell’Etruria Centrale. For museum-goers, there’s also a Museum of Wine and Oenology in Montespertoli (via Lucardese, 74). In short, this area is practically a Theme Park for wine-lovers. I plan to return soon this summer, when I have some time off for tasting and exploring! This entry was posted in Italian Wine Regions and tagged Castelfiorentino, Chianti, Chianti Region, Italy, Montespertoli, Tuscany, Veni Vidi Vino Italy, Vernaccia di San Gimignano. Bookmark the permalink.